Come to Punta Cana for your deep-sea fishing. The Dominican Republic has become more and more popular in the past few years for our water sports. 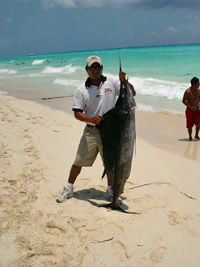 In particular, fishing has become one of the Dominican Republic's leading activities. 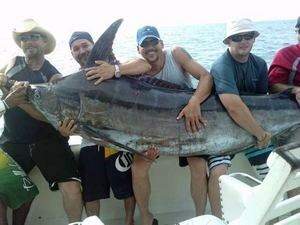 We are here to offer you possibly the best deep fishing experience of life. We are popular with our clients because of our remarkable services. We have a professional, English-speaking crew and a beach staff that really cares to give you the best service you could want. Our main goal is to make our customers happy. Just name it and you got it. For your convenience, Hispaniola trip is available for fishing excursions 7 days a week, twice a day. In addition, all of our boats are well maintained and feature new electronics as well as Penn, Shimanos rods and tackles. We focus on the safety of our customers, so security for us is our top priority. One of four Hispaniola trip charter boats is offered by First Class Fishing. Board this charter boat, named the Altamar, for some fun and exciting Punta Cana sport fishing. As a captain, it is a pleasure to work in Punta Cana, an area recognized worldwide for its spectacular fishing, particularly its marlin hot spots just minutes from the marina. It is a privilege to work alongside these professional and experienced captains and crew, and to have fishing aficionados from all over the world as our guests. Anthony Pérez, founder of Best Punta Cana Excursions. We harbor up to six boats, including all baits, Penn internationals, Shimanos reels and rods tackle, as well as all-right beverages and confortable transportation from your hotel. What more could you ask for? In addition, all of our boats are well maintained and feature new electronics. In addition, we focus on the safety of our customers, so security for us is top priority. First Class Fishing - If you are looking for a place to vacation that has great fishing plus much more in the way of activities and tours then Punt Cana in the Dominican Republic is the place for you. Punta Cana fishing is everything we say it is and makes for an exceptional fishing trip with many plentiful marine resources to catch but it also has more entertainment for the family and kids. After all Punta Cana is a tropical Caribbean paradise and it certainly lives up to all the hype. Take a morning or afternoon cruise from Punta Cana to try your hand at deep-sea fishing. Depending on the season you might land wahoo, white marlin, mahi-mahi, kingfish, blue marlin, sailfish or barracuda. Deep-sea or big-game fishing is extremely popular from Punta Cana. The variety and bounty of game fish in these waters makes throwing your line here an extremely rewarding experience. The captain and his crew know all the right spots to find big game fish, and they have all the equipment you'll need onboard. All you need to do is just hook that fish. If your hotel is not listed, a free shuttle is available.